Chard and kale, usually cooked, make a crisp green salad you can actually make, and dress, the day before. I devised the original version of this recipe when I was invited to a locavore potluck dinner meeting. Each guest was to bring a dish in which every ingredient had been grown or produced within 100 miles of home, with the exception of salt and olive oil. It was the beginning of January, so the possibilities were limited. The locally grown chard and kale looked really good, but what would I do with them? I didn't want to take cooked greens and have to reheat them. I thought if I sliced the chard and kale finely and left them to marinate in some sort of dressing overnight, that would make a nice change from the usual green salad. Vinegar was out since I didn't know of a within-100-miles source for it. But I had trees full of Meyer lemons to provide acid and Satsuma mandarins to add color and sweetness to complement the slight (and quite pleasant) bitterness of the greens. Satsumas have the added bonus of being seedless and easily segmented. But now, in mid-April, the Satsumas are long gone. So I've replaced them with oranges, a little less glamorous maybe but still delicious. You might want to add some black pepper or a favorite herb; but even without the constraints of the 100-mile locavore diet, I prefer the salad with no embellishments. Start the salad the day before it is to be served; the greens need time to tenderize a bit. I do the chiffonade thing with the chard and kale, stacking and rolling the carefully washed and dried leaves and slicing them thinly into 1/8-inch-wide ribbons. In small bowl, whisk together the salt, juices and oil. In 3-quart bowl, combine chard, kale and dressing. Cover and refrigerate until next day. 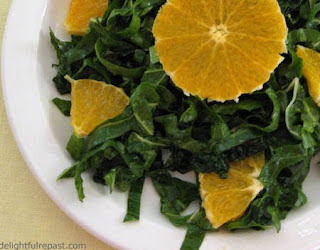 Two hours before serving, toss greens and add oranges. This is really good! I don't like cooked greens all that much, so this is a great alternative. Very tasty! Thank you! But I hope you'll try my cooked collard greens recipe when I post it. You just might like it too.